EPA Announces a New Ozone Standard. But Will It Make any Difference In Texas? Not Without a Push. On the day before Thanksgiving EPA Administrator Gina McCarthy went forward with a recommendation to lower the federal ozone, or smog, standard from the current 75 parts per billion (ppb) to somewhere between 65 to 70 ppb, while also agreeing to take public comment on a new standard as low as 60 ppb. While this might seem like a big step, these are actually the same numbers that have been circulating since George W Bush was president. Since 2008 the EPA's own independent science advisory panel has recommended a national standard in the 60 to 70 range twice – and twice this recommendation has been put on a shelf because of political considerations, most recently in 2011. Now, with the re-election campaign behind them, the Obama Administration has decided to tepidly move forward. Making the range recommendation it did means that the agency will take comments and mull it over for a year before deciding to issue a specific number in December 2015. There will be at least three national public hearings as part of that comment period – although we don't know the locations of those hearings yet. Once it decides on a particular number for the standard, the Administration most likely will give states until 2025 to comply with it. Or in Texas' case, we should probably say they'll give the state until that year to fail to achieve the standard for the first time. …the new regulation would by 2025 prevent from 320,000 to 960,000 asthma attacks in children, and from 330,000 to 1 million missed school days. It also estimates that by 2025 the rule would prevent 750 to 4,300 premature deaths, 1,400 to 4,300 asthma-related emergency room visits and 65,000 to 180,000 missed workdays. Besides saving lives and preventing illness, the effect of the new standard will be to broaden the number of counties brought into "non-attainment" by the EPA across the state, and thus subject them to the same ineffectual TCEQ proposals for cleaning up the air DFW has been experiencing for decades. Reaction from industry and Austin was predictable and predictably wrong-headed. Over the last 20 years, as the national standard has been lowered to account for the increase in knowledge we have about the human health effects of smog, Texas has never supported any change. Any. Never. It's always argued that lowering the standard wasn't necessary to protect public health and too costly to industry – causing economic calamities that never seem to happen. If it was up to Austin, we'd still be choking at the level of 125 ppb that was in effect up until the mid-1990's. Of course in recent years, Rick Perry's TCEQ has added a nice Orwellian touch by having its "toxicologist" argue that smog isn't really that bad for you. Maybe that's why no one has had a lot of confidence in the state's ability to write a new smog plan for DFW that will get levels down to the current 75 ppb standard by the deadline of 2018. That plan is being put in the regulatory pipeline by TCEQ and will be going to public comment itself beginning December 26th (yes, that's right, the day after Xmas) and running through January 30th. They'll be a public hearing on it as well in he next 60 days, probably in Arlington, although details haven't been released. Although it's called a plan, there's no planning in it. The state proposes to do absolutely nothing to reduce pollution from any major smog source. Nada. No new controls on cement kilns, coal plans or gas facilities. Instead it says that the federal government's new gasoline mix, to be introduced in 2017, will produce enough of a decline in smog to get the region "close enough" to the 75 ppb standard. Never mind that that standard is now medically obsolete according to the EPA, and God forbid the state should require more pollution controls to aim for the lower 65-70 level we all know is on its way. Nope. At last count there were still three local monitors that hadn't even reached the 75 ppb level by 2018 in the state's computer model prediction, and that result relied on a steep decline in oil and gas drilling that may or may not happen. According to the Clean Air Act, the state is supposed to be requiring major sources of smog pollution in DFW to install all "Reasonably-Achievable Control Measures"(RACM) that could help speed our compliance with the 75 ppb standard. This would include things like SCR (Selective Catalytic Reduction) on the Midlothian cement plants and East Texas coal plants and electrification of compressors in the Barnett Shale gas patch. However, Austin says those ideas are not "technically or economically reasonable." The state might have a point – if companies within those same industries weren't already turning to these options voluntarily. For example, Holcim has applied for a permit to install SCR in one of its Midlothian cement kilns. So is Rick Perry's TCEQ saying a multinational cement company operating in the private market with two competitors down the road is installing a piece of pollution control equipment out of the goodness of its bottom-lined heart that's neither technically or economically feasible? Are Holcim's managers a bunch of profit-losing unrealistic treehuggers? Hardly. Likewise, SCR has been installed on plenty of US coal plants – just not on the oldest dirtiest one in East Texas that need it the most. It's not a new technology at all. Same with electric compressors. In fact, those are required now under some city drilling ordinances. Wouldn't you hear banshee-like howls from the oil and gas industry, much less lawsuits, over those ordinances if that was not a technological or economically feasible alternative? In fact, electrification saves money by reducing the waste of gas product it takes to run conventionally-powered compressors. This is the ridiculous result of a regulatory agency being an extension of a presidential campaign that promises to be easy on business and tough on the EPA. The order has come down from on high that no new pollution control requirements are to be sought by TCEQ in these smog plans, no matter how silly it makes the state look, or how much dirty air Texas residents have to breathe. That's why in addition to calling for these kinds of pollution controls in the public comment process, and only having those comments fall on deaf ears in Austin, citizens must also put pressure on the EPA – too often the state's enabler in these matters. As the ultimate authority on enforcing the Clean Air Act, the EPA can reject the state's plan and send it back to the drawing board with specific recommendations, or substitute a new one of its own creation – like it just had to do with the state's terrible haze-prevention plan that would have taken 150 years to work. Certainly citizens have to put their case for federal action on the record during the TCEQ public comment period, but then we have to take that case directly to EPA and make them live up to their own regulations. And if they won't, then the next stop may have to be federal court. 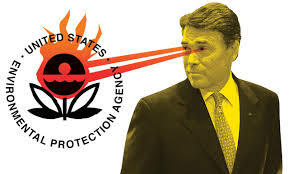 If the last 20 years of clean air wars in Texas has taught us anything, it's that it won't matter what new smog standard the EPA sets, or whether the current one is being enforced or not, unless a federal agency or court, prompted by citizen action, make it matter.